This week has been a bit hellacious. I woke up Monday morning to find two puddles of blood by the back door where Suki usually sleeps, and Suki was no where to be seen. I whistled and called for her but she didn’t come. Toby and I started looking for her. We found that a bear had broken into the fenced chicken coop area and emptied the barrel of scratch (I hadn’t yet cleaned up since we got rid of the chickens last week). The bear also broke into the compost bin on the other side of the house from the coop. About 10 feet from the front door was a few clumps of Suki’s fur. Our neighbors came up with their dog to sniff around, and we all searched for hours, with no sign of her. I thought she was gone. I figured she had fought with the bear and then went off into the woods to die. My only hope was that she died quickly, without much pain. I was fidgety all morning, trying to keep my hands busy while my mind spiraled with thoughts of my poor, sweet dog. Mid-day, a neighbor who lives way down the hill (and who we’ve only talked with once in the past 5 years) drove up to our house and said they found our dog in the woods by their house. She was alive, but injured. Toby went down there and wrapped her up in a blanket to get her in the car. I didn’t even look at her injuries, I just drove straight to the vet’s. The vet was fabulous, saw to her immediately, and even let me come in the back for the procedures. Her left hind leg was badly injured. Either the claw or the jaws of the bear had gotten a good swipe at her. There was a lot of bruising and some very deep punctures. 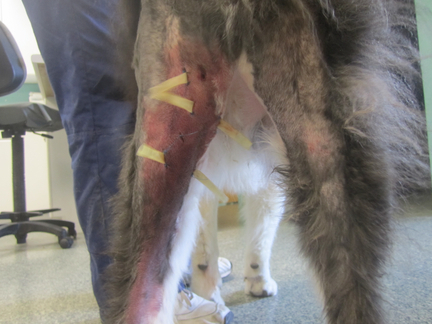 Drains were placed to help keep the fluid flowing out (and not building up under the skin), and the vet stitched up what she could. Once she was stable, I brought her home. For the first two days, she wouldn’t pee, though she was walking well considering her injuries. For the first 3 days, she wouldn’t eat. I had to force feed her by putting liquid food in a syringe and squirting it in her mouth. Today, she has begun eating well and is peeing on her own. 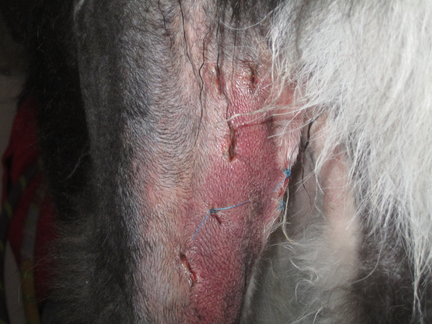 Her drains were taken out yesterday and her wounds have begun to heal, though there is still a lot of bruising. Her stitches will remain for another week. She is on lots of meds and herbs, but I am truly amazed at the strength of my sweet, old Suki. She never complains. My sweet Suki is an 11 year old Akita (that’s like 90 in human years for an Akita), and yet she will defend her home and her family against a full sized black bear! What an amazing protector!!! From now on, she will have more loving, more treats, and more snuggles!!! On a bit of a side note, Suki was diagnosed with heart worm 4 months ago. I was very surprised, because we aren’t supposed to have that much in our area. But, apparently I was wrong. I’ve been using herbs for her instead of the very harsh meds that are available through the vet right now. I’m happy to say that they did a heart worm test when she was at the vet this week and she is heart worm negative now!!! The herbs did their job. Now, she just needs to work on healing that leg and living to a happy, spoiled old age. There are a couple of pictures to follow, but they aren’t for the squeamish. So, be warned. This is right before the drains were removed. This is how the wound looks today. It’s hard to really see the extent of the damage from this angle, but she’s not about to let me take a picture of her inner thigh right now. « Do you see a common color scheme here with our animals? Is she up to visitors and a biscuit yet? She loves her family to fight like that. Hi there, I enjoy your blog! I, too, am interested in herbs, but I am a novice. What herbs did you use for the heart worms? And are they used as a preventive, or used only if heart worms show up? Good job, Suki!! Yes, Kathie. She would love you see you!! I used straight Black Walnut for her heart worm. There is no medical research that it is good for heart worms, but it is good for many other types of worms and parasites. (I have seen other personal accounts that it worked for others and their animals, but you just never know if what’s on the internet is true.) For Suki, who is an 85 pound dog, I used 60 drops 2 times a day, with each feeding. It can be used as a preventative, but I feel like it’s a pretty strong herb to be using long term. If I did, I would cut back on the dose. For her heart and lungs, I gave her a mixture of Hawthorne, Licorice, Dandelion leaf, and Ginger. She also got 60 drops of this with each feeding 2 times a day. I’m not an expert in herbs for animals, but this worked well for her. I’m not sure yet how I’m going to handle prevention. I’m just wanting to get her through her injuries first. Oh, Maria! I just stopped by to see what exciting homeschooling activities you had planned. I had no idea how serious Suki’s injuries were. I am glad she is feeling better. How scary that must have been. I am glad the worst is past. i’m so happy your suki is recovering. what a sweet hero. and what a nice family she has. I’m so happy to hear about your dog recovering whenever this was posted. I also make black walnut tincture, but I’m happy to see how you make it to know if I’m doing it right or not. I would love to know if you find out anything about part 1 prevention. I have not given my dogs really anything for heartworm much except the liquid Ivermectin I used to have when I had goats. But I have not given it to them in several months. When a dog I had once got heartworms in 2012, I as well did not use the medicine from the vet. I started her on a muscadine seed capsule from my company three times a day, the coughing stopped immediately. That was what I had on hand & I knew it would support the heart. and in three months she went from strong positive to just positive. I at that time added some essential oil capsules for parasites and in three more months she was negative. So if we can give a few drops of black walnut tincture once a week for prevention I would love to know that. Thank you. Kelly, we did continue to give my dog the black walnut preventatively for a few years after her heartworm diagnosis and she never turned up positive again. She may not have been exposed again, but this was our only choice since the Ivermectin caused such a severe reaction in her. She lived a healthy life until she was almost 15, with is very old for an akita!